NAC is a precursor of the tripeptide glutathione - a critical antioxidant, with roles in xenobiotic detoxification and amino acid metabolism. Glutathione depletion is characteristic of many conditions of impaired health (Curr Opin Clin Nutr Metab Care 1999;2:487-92). NAC acts as a mucolytic agent and thus assists in restoring normal respiratory function (Eur Respir J 2000;16:253–62; Clin Ther 2000; 22:209-21; COPD 2006;3:195-202.). 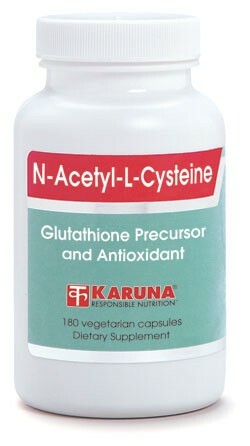 By acting as a reliable oral glutathione precursor, NAC helps maintain normal immune, liver and cardiovascular function (Altern Med Rev 1998;3:114-27). Suggested use for adults: 2-6 capsules per day in divided doses between meals, or as directed.